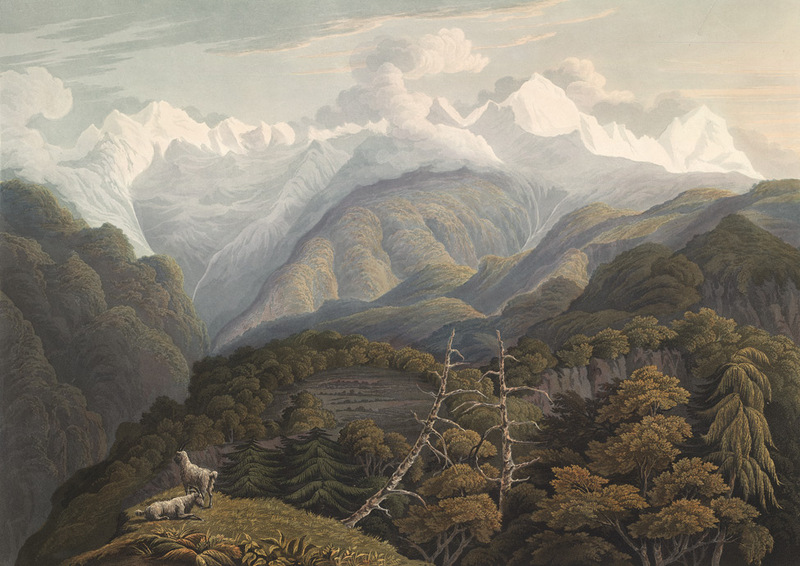 This aquatint was made by Robert Havell and Son from plate 8 of JB Fraser's 'Views in the Himala Mountains'. This snowy Himalayan massif is known as the Bandarpunch or Monkey's Tail. It is 6316 metres high. The source of the great river Yamuna lies here. On his arrival in the river valley Fraser decided to journey on to the source. He wrote: "After a succession of ascents and descents of various importance in a space of twelve miles and a half we reached the ridge ... and saw the River Jumna winding far below us like a silver line in the deep dark hollow of its bed."